On September 14, 2018 the Lincoln Hills Foundation Board hosted its third annual Grant Recipients and Community Partners Meeting at the Kilaga Springs Lodge. Founded with a mission to promote and fund solutions and programs that will enhance the quality of life for senior residents in Lincoln, the Foundation is operated entirely with volunteers. Thus we are able to assure our supporters that their donations go entirely to fund services in our Lincoln community. Our mission could not be fulfilled without the work of the groups and organizations funded by the Foundation or the collaboration of key community partners that we honored: AARP Foundation Tax Aid program; Alzheimers/Dementia Caregivers Support Group;Bosom Buddies; Del Oro Caregivers Support Resource Center; Friends of the Lincoln Library; Lincoln Senior Center; Multiple Sclerosis Support Group; Neighbors in Deed; Neighborhood Watch; Rotary; The Salt Mine; Sun City Lincoln Hills Association and Board; St. Vincent DePaul; and Seniors First. neighborhood watch groups to connect residents and increase community safety. Additionally we recognized the collaboration of Rotary, the city of Lincoln, Lions and Seniors First in the development of a senior center in Lincoln. 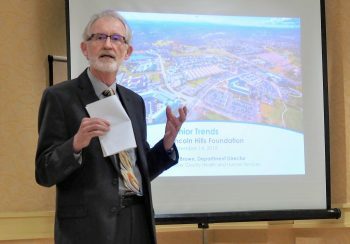 Finally the administrative support and collaboration from the Sun City Lincoln Hills Association to the Lincoln Hills Foundation was recognized. Following afternoon refreshments, informal networking and sharing about the work of our organizations, there were two informative reports with key information about the status of seniors in Placer County and in Lincoln. Jeff Brown, Director of Placer County Department of Health and Human Services updated us about the trends and issues impacting the increasing population of seniors across Placer County where the 60+ population will triple between 2000 and 2040. Finally, Councilman Peter Gilbert and Jamee Horning, President of Board of Directors of Seniors First presented information about the thriving collaborative effort that is creating the Lincoln Senior Center, scheduled to open later this fall.